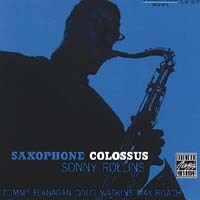 One of the pivotal recordings in bringing about the widespread acceptance of Sonny Rollins as a major figure, Saxophone Colossus inspired critics to write scholarly analyses and fans to revel in hard-swinging invention humor and tender-strength balladry. Up to this album, while most musicians recognized Rollins as one of the new influential forces in the jazz of the 50's, most critics were carping at Rollins or damming him with faint praise. "St. Thomas," a traditional West Indian melody which Mal Waldron remembered as "The Carnival," was recorded by many artists after Sonny introduced it here. It remains a jazz standard today. The contributions of Tommy Flanagan's elegant swing, Doug Watkin's steady lift, and Max Roach's most musical accompaniment and soloing make this a landmark album. Recording engineered by Rudy Van Gelder. I expected what I got, and that was acoustic heaven. This was an experience that enthusiast should go through at least one time if one is a lover of good music and even better jazz. The mood of the record is Bliss.